If you’ve ever tried to define the term “contemporary classical music” in clear and decisive language, chances are that you’ve found it impossible. Modernism, post-modernism, spectral music, polystylism, historicism, neo-romanticism, new simplicity, and new complexity, as well as minimalism and post-minimalism — encountering these categories might leave you throwing up your hands in frustration. Honestly, the best way to understand the breadth of contemporary classical music is to experience it live — as often as possible. 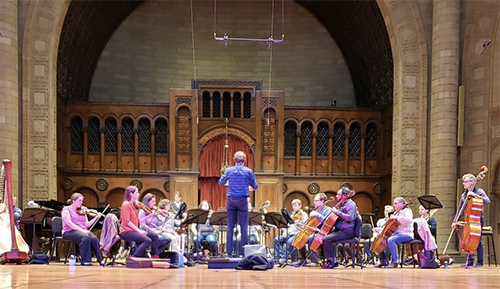 Over ten days in March, the Cleveland Chamber Symphony presented its fourth annual NEOSonicFest, featuring outstanding performances by artists, ensembles, and organizations from Cleveland’s vibrant new music scene. 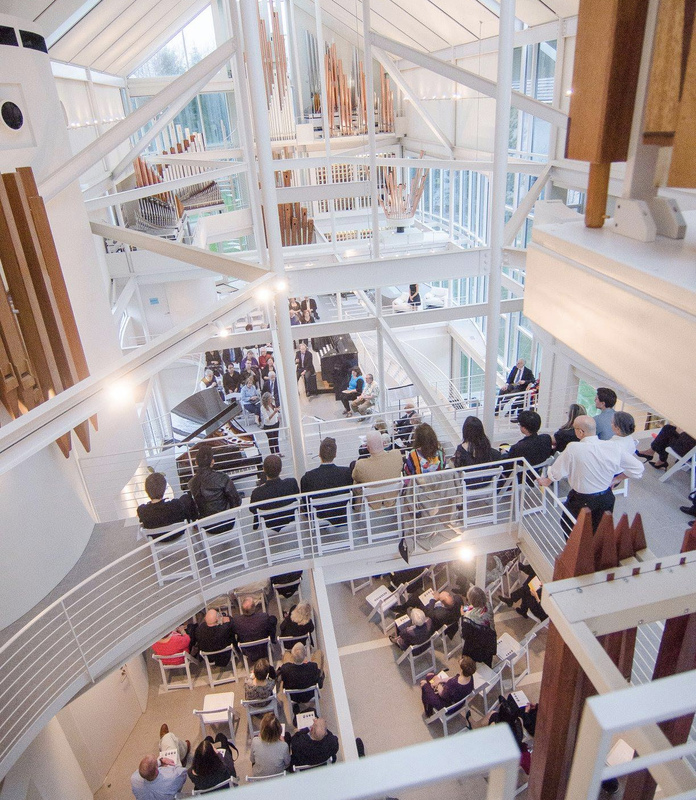 The Festival included works by pioneers in the field — such as Olivier Messiaen, György Ligeti, and Donald Erb — as well as composers who are at the middle stages of their careers. 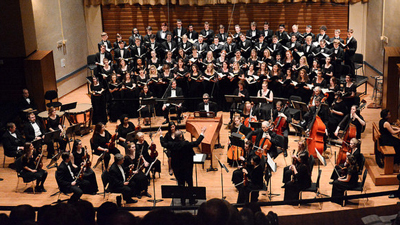 The highlight was a concert dedicated to music by young composers from area conservatories and schools of music. I attended five of the Festival’s six performances. 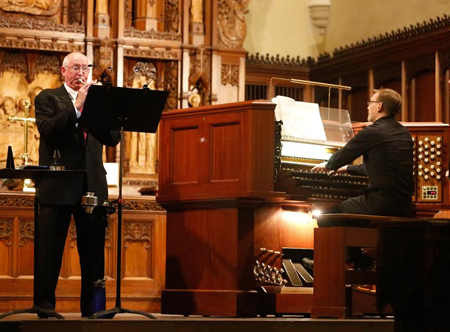 NEOSonicFest opened on Friday, March 17 at Church of the Covenant with a recital by the brilliant organist Jonathan Moyer. 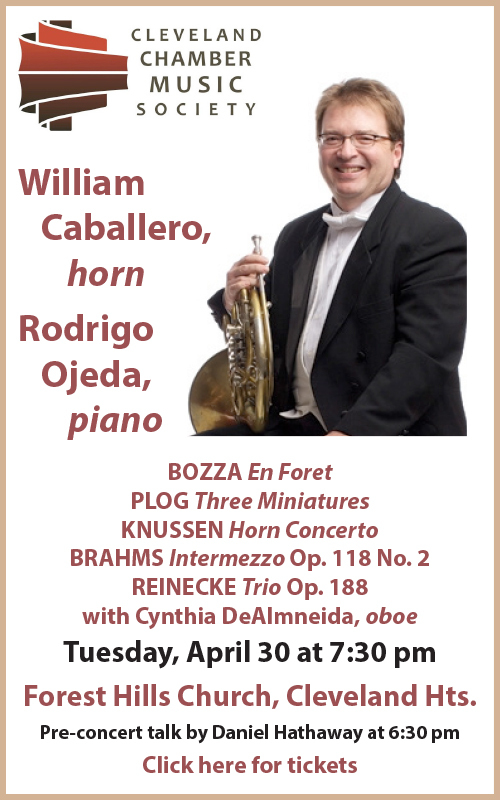 Taking profit of the church’s two distinct styles of instruments, his program was a feast for the ears from start to finish. For the 17th-century-style Newbury organ, located in the gallery, Moyer chose Arvo Pärt’s Mein Weg hat Gipfel und Wellentäler (“My Way Has Summits and Valleys”) and Franz Danksagmüller’s Circuli, along with his own Merry Fugue. But it was Moyer’s riveting performance of György Ligeti’s haunting Volumina that left you as breathless as the instrument itself. 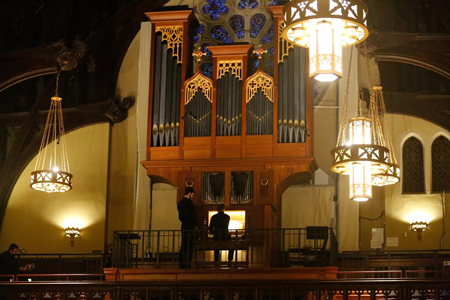 On the American classic-style chancel organ, Moyer produced colorful registrations during Olivier Messiaen’s “Chant d’oiseaux” from Livre d’orgue and murky hues in Apparition de l’église éternelle. Joined by the outstanding trumpeter Roy Poper for Petr Eben’s engaging Okna — based on stained-glass windows by Marc Chagall — the duo brought the evening to an end in fine fashion. 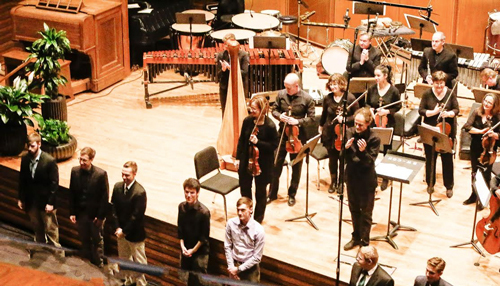 On Wednesday, March 22 at Baldwin Wallace’s Gamble Auditorium, the Cleveland Chamber Symphony, under the direction of Steven Smith, presented its annual Young and Emerging Composers concert. This year the program provided seven young composers with the opportunity to have their works performed by a professional orchestra. Robert Justin Frankeny’s (Baldwin Wallace) Conniption No. 1 is a playful work of tossed-off motives, sustained pitches, and fanfare-like interjections by the winds and brass. For his Single Seed, Justin Weiss (Oberlin) creates long, harmonically lyrical lines that gradually transform into lush, colorful sound clouds — just as a seed becomes a beautiful flower. Alex Morris (University of Akron) told the audience that the Dream Catcher is the spirit that collects nightmares and passes them onto the sleeper. Morris’s seductive writing captures that image wonderfully. Andrew Keller’s (Kent State University) The Forgotten Child of Zeal tells the tale of someone born with magical powers who evolves into a force of evil. As the story unfolds, the work conjures a vivid sound palette. Gabriel Novak (Cleveland Institute of Music) brought his jazz background to the absorbing Listen to ‘em. Based on a lullaby, the work is full of beautiful textures and inventive transitions. Daniel Bayot’s (Bowling Green State University) three-movement Monoamines is all about mood disorders. “Deficient (DA)” is full of multiphonics, while “Ruminations (5-HT)” cries out with rhythmic drive. The concluding “Excess (NE)” begins with repeated dance rhythms and ends by fading away to nothingness. 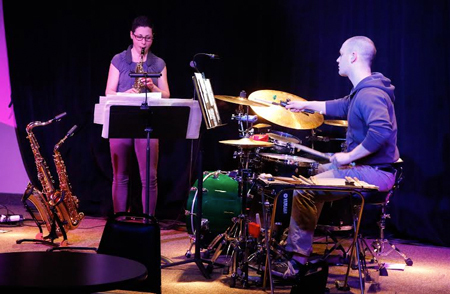 Sean Parks’ (Cleveland State University) Impulse thrives on long, rhythmic phrases interrupted by lyrical motives. The work was the perfect conclusion to the evening. 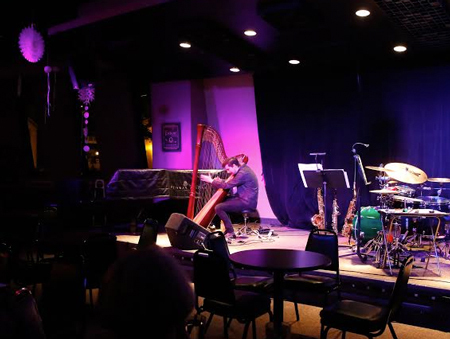 At the Bop Stop on Thursday, March 23rd, harpist Stephan Haluska opened with a set of intriguing improvisations. Electronically layered sounds were enhanced with a variety of rhythmic motives (produced by tapping the instrument) as well as squeaking sounds (rubbing fingers on the soundboard). The evening also included a set by the always creative duo Patchwork (Noa Even, saxophones, and Stephen Klunk, drum set), including seven works by composers with Ohio connections. 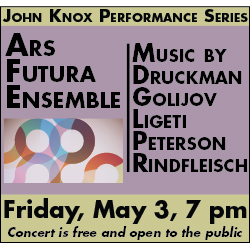 As they have in the past, Even and Klunk played with astonishingly tight ensemble even during the most complex rhythmic passages. The array of sounds they are capable of producing is amazing. Highlights included Jonn Sokol’s smooth Vermilion and Evan Williams’s catchy Breathe. 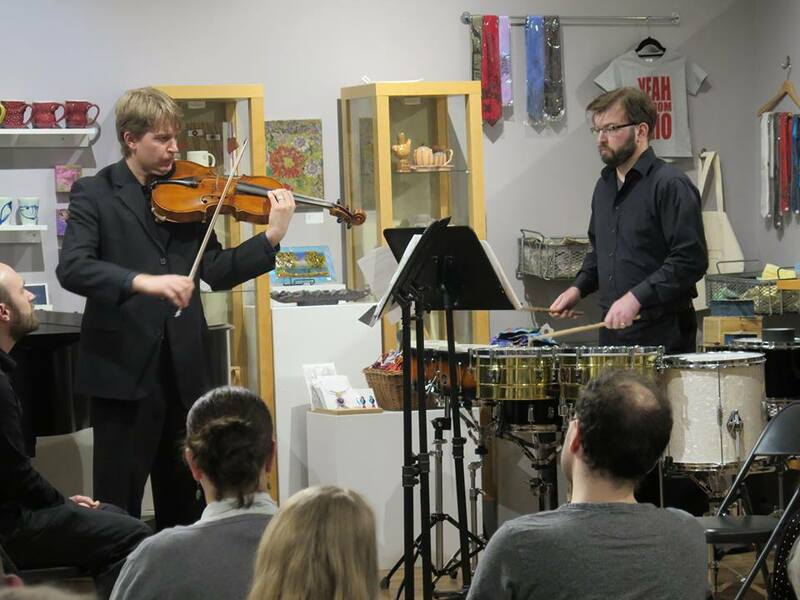 No Exit’s Friday, March 24 program at Heights Arts opened with Ryan Gallagher’s Night Falls Fast for viola and percussion. The work begins as though the two performers are working at cross-purposes, later evolving into a single unit. Violist James Rhodes and percussionist Luke Rinderknecht were magnificent. Gunnar Owen Hirthe brought an abundance of life to the world premiere performance of Michael Rene Torres’s Voices of Contempt for solo clarinet. Traveling from the lowest to the highest range of the instrument, Hirthe played with nimble technique. The sometimes angry-sounding work ends with a final screech before fading into silence. Matthew Ivic’s Piano Quartet No. 1 is defined by long sustained lines and intermittent rhythmic blasts. 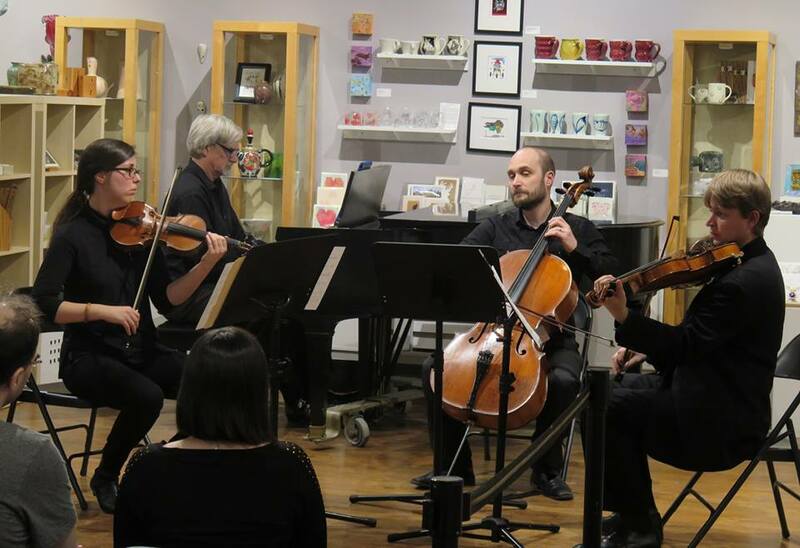 Violinist Cara Tweed, violist James Rhodes, cellist Nicholas Diodore, and pianist Nicholas Underhill gave a convincing reading of this anxious work. The evening also featured an outstanding performance of Bohuslav Martinů’s Duo No. 2 for Violin and Cello by Tweed and Diodore, while alto flutist Sean Gabriel found all the wit and whimsy in Donald Erb’s Music for Mother Bear. 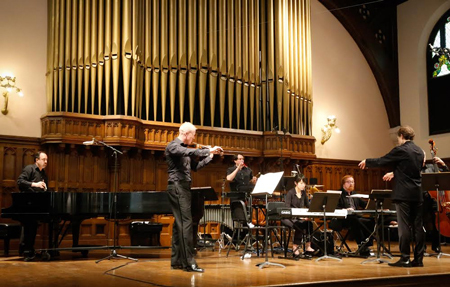 The 2017 edition of NEOSonicFest concluded with a concert by the Cleveland Chamber Symphony on Sunday, March 26 at 4:00 pm in Harkness Chapel. Steven Smith led the ensemble in the 50th-anniversary performance of Donald Erb’s Reconnaissance along with a repeat performance of Music for Mother Bear. Dedicated to Robert Moog of Moog synthesizers, Reconnaissance may be the first piece that combined electronic instruments with live performance by acoustic instruments. For the work, Moog created an electronic instrument that still exists in some form in the electronic music studio at the Cleveland Institute of Music. 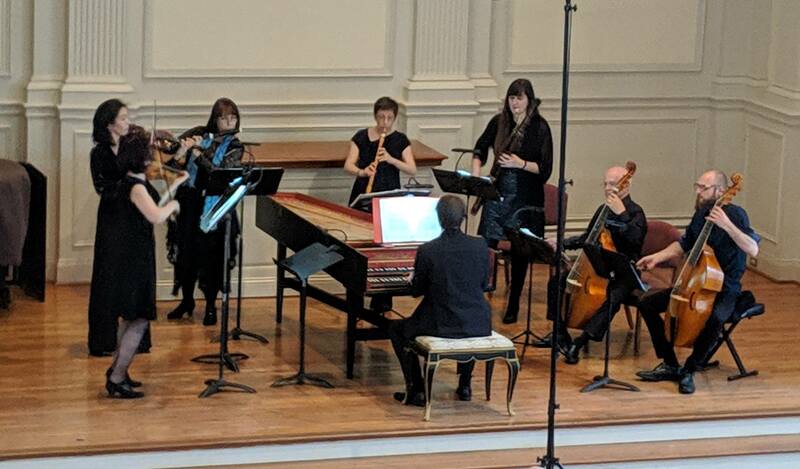 The piece was performed twice on Sunday: first in a version that includes an additional movement composed later for a recording, and then in the original version. Written in 1965, it’s difficult to imagine that Reconnaissance was considered groundbreaking when it received its premiere in 1967 at a Music of Our Time concert in New York — by today’s esthetics it’s not ear-shocking. Scored for violin, bass, two synthesizers, piano, and a range of percussion instruments, the piece requires the players to employ a variety of extended techniques throughout. Erb creates an imaginative cacophony of sounds and impressively uses each of the six voices as equal partners — the electronics and the acoustic instruments are fully integrated. Which of the two versions works best? The added movement, which served as the fourth of the five during the first hearing, sounds out of place, interrupting Erb’s skillfully crafted musical arc. When it was removed for the second hearing, his tidy craftsmanship came through in a delightful way, creating a seamless flow from one movement to the next. It’s a shame that Reconnaissance has only had one other performance since its premiere because it is not a piece for the museum, in fact, it’s quite beautiful. 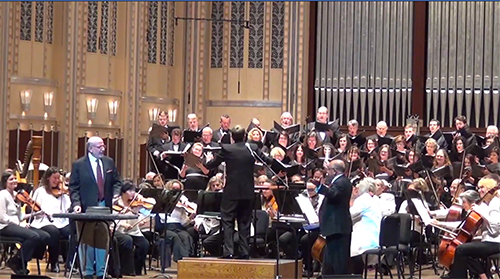 Published on ClevelandClassical.com April 10, 2017.